Trim-A-Rim's reversible mirror and magnetic whiteboard with customizable borders is even more colorful and fun when paired with vibrant Hello Angel designs. Whether for back-to-school as a locker mirror and dry erase, for the kitchen fridge, bedroom or office, as a unique personalized gift, or to add a DIY touch to any holiday, party or group gathering, Trim-A-Rim now offers more options than ever for personal creative expression and fun with friends and family. ...it just tickles me to think about my New Zealand doodles brightening up US school lockers, kitchens, offices and the like. Innoversa Corp., maker of the popular Trim-A-Rim™ reversible home, office and locker mirror and magnetic whiteboard, is excited to welcome New Zealand's talented Angel van Dam (whose design brand is Hello Angel) into its family of artists and to make Hello Angel's fun, bright and colorful artwork available for free use in Trim-A-Rim's changeable clear display rim. An introductory video giving a sneak peek at Hello Angel's eye-catching art is available on Trim-A-Rim's YouTube channel. Hello Angel's vibrant designs can be found in the free collection of Downloadable Ready Rings and in the Hello Angel Collection in the Art Library of the online Design Studio, also at no charge. 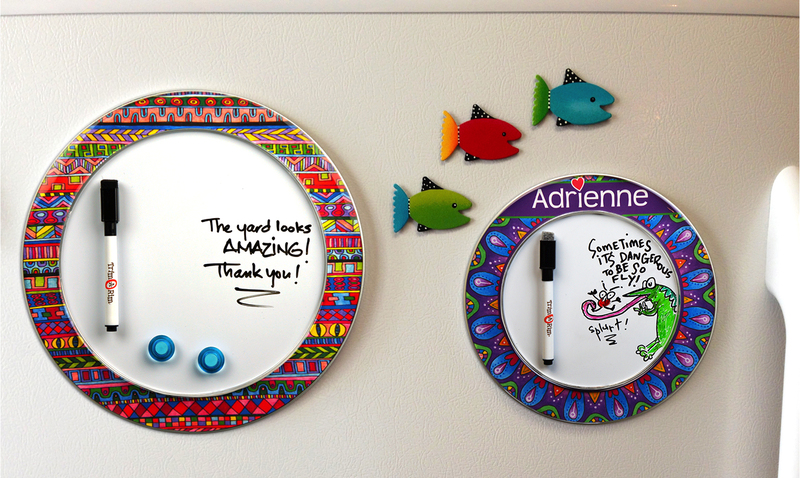 In reference to this new creative collaboration, Angel reports that "When my daughter and I first saw these cool Trim-A-Rim whiteboards and mirrors, I knew this would be a fun project to get involved with. I love how I can share my creations with a larger audience, and that the art will be enjoyed everyday in such a practical way. The personalization aspect is also wonderful -- I'm a big fan of creative fun and people of all ages celebrating their own unique style. And it just tickles me to think about my New Zealand doodles brightening up US school lockers, kitchens, offices and the like." In further news, just in time for leisure summer get-togethers, back-to-school and the approaching holiday season, a new Party Fun collection of creative resources has been added to Trim-A-Rim's website. Intended for all ages, included are fun whiteboard games, tips and tricks for creating great borders, free downloadable party invitations and other resources to support party hosts and event planners -- or anyone looking for a fun and practical craft to enjoy with a few friends on a rainy day, at a church or other group get-together, fundraiser or celebration. 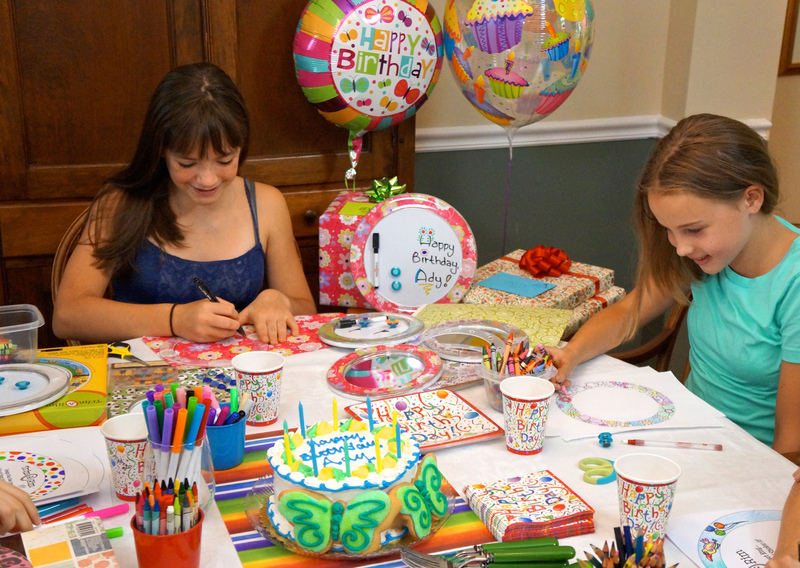 Trim-A-Rim makes a unique party favor and creative activity for birthdays, bar or bat mitzvahs, sorority events, slumber parties and other gatherings. Trim-A-Rim's Facebook page is the place to go for details about exciting contests and give-aways celebrating Party Fun and the addition of Hello Angel's distinctive art. Included is a Party Photo Contest, where two lucky entrants will win $500 each. No purchase is required to enter any of the company's contests. Trim-A-Rim's mission is to inspire creativity and to allow everyone to show their own personal style. Crafters and non-crafters alike can visit the company’s free website to create and print their own border designs or to choose pre-designed interchangeable inserts to place inside the clear frame. Teens and students love the Design Studio for creating borders to celebrate their school colors, team names, and inspirational quotes. Nothing shows off school spirit and personal style like a custom-designed locker mirror or a message board for the dorm room or sorority. And moms enjoy Trim-A-Rim on the kitchen fridge as the family message center, or as the perfect creativity-inspiring activity and favor for their kids' birthday and slumber parties. Trim-A-Rim, a reversible mirror and magnetic whiteboard with a customizable clear frame, is available in two diameters – the 10.25” Full-size and 7.5” Mini ("locker size"). Easy to hang by the strong magnets or keyhole on the back, this product comes with a dry-erase marker, two colorful note magnets, a variety of pre-printed and blank ready-to-color insert rings, and a tracing template. Trim-A-Rim is constructed of durable, high-quality materials built to last, and is independently safety-tested and certified. It was designed and developed by Innoversa Corporation, a Reston, Virginia company committed to creating innovative and versatile consumer products.